After much anticpation, the Department of Education (DoE) Secretary Betsy DeVos released a proposal earlier this month for how colleges and K-12 schools must respond to allegations of sexual harassment and assault. Now, just over a year after DeVos rescinded the 2011 “Dear Colleague” letter of guidance from the Obama administration which laid out how federally funded institutions should address sexual misconduct involving students and employees, these new proposed Title IX regulations are in. The new rules will govern the way Title IX of the Education Amendments of 1972 is implemented and will not be finalized until after a public comment period. This proposal was revealed in the same week that seven women filed a federal lawsuit against Dartmouth College, alleging that it allowed three tenured professors to discriminate against, harass and sexually assault female students for more than a decade. This is the latest sexual misconduct controversy in 2018 following the Kavanaugh trials and cases against serial sexual assaulters at Michigan State and the University of Southern California. Reactions to the proposal are divided. Men’s rights groups, lawyers for the accused and conservatives are in favor of the rule changes, while women’s rights groups, survivor advocates and liberals condemn them. “Those practicing Title IX on our campus are dedicated to ensuring that there is equity of process, appropriate resources and education so that all members of the campus community can support a culture of respect,” said Title IX Coordinator Tanhena Pacheco Dunn. Pacheco Dunn added that SUNY New Paltz “does not see a need to change practices in our reporting or hearing processes” at this time. According to a statement from SUNY Chancellor Kristina M. Johnson, SUNY adopted a uniform policy and program for its 64 campuses to prevent and respond to sexual and interpersonal violence. New York State also enacted Education Law 129B ‘Enough is Enough,’ which legislates education, reporting, support and adjudication processes for sexual assault cases in public and private college statewide. “The structures and processes outlined in both the SUNY uniform program and the ‘Enough is Enough’ legislation clearly provide due process protections and equitable support of all parties,” Pacheco Dunn said. 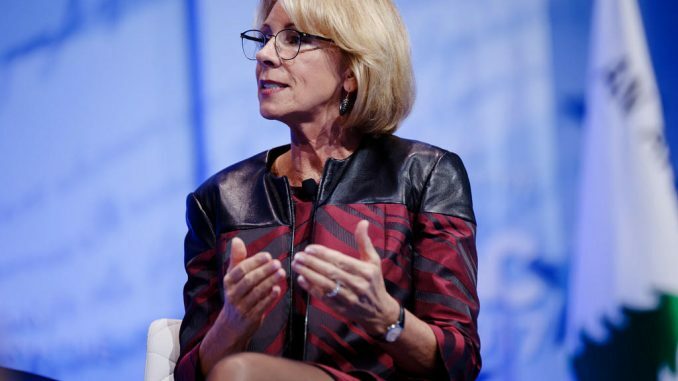 The new proposal reflects DeVos’ previously expressed opinion that guidelines from the Obama administration produced a “failed system” which denied the accused the right to due process and institutional overreach. Under existing colleges guidelines, the standard used to prove sexual harassment is “preponderance of the evidence,” prioritizing the evidence’s quality rather than its volume. This means sexual harassment allegations don’t need to be proven beyond reasonable doubt. The new guidelines would allow colleges to use either the existing standard or the stricter “clear and convincing evidence” to adjudicate cases. The new rules would also restrict the cases colleges are required to investigate to include incidents that occur on campus only. Colleges would also no longer be mandated to pursue cases that are not reported to officials who have authority to take corrective actions, such as a Title IX officer. Finally, the new regulations would permit cross-examination of accusers by an accused person’s representative. This combined with narrowing the definition of sexual harassment may signal a lack of support for victims, according to Pacheco Dunn. SUNY has also released web-based tools to support victims and survivors of sexual assault or interpersonal violence such as the Sexual Assault and Violence Response (SAVR) which includes important policies translated into 120 written languages and American Sign Language. SUNY, in partnership with the City University of New York and with the support of individual campuses and the New York State Department of Health, developed a Sexual and interpersonal violence Prevention and Response Course (SPARC), an online resource to help train educators and students in the prevention of sexual, interpersonal and related violence. This resource is being provided to other colleges and universities free of charge, and encompasses training requirements under Title IX, the Clery Act as amended by the Violence Against Women Act and, for New York State colleges and universities, the Enough is Enough legislation.